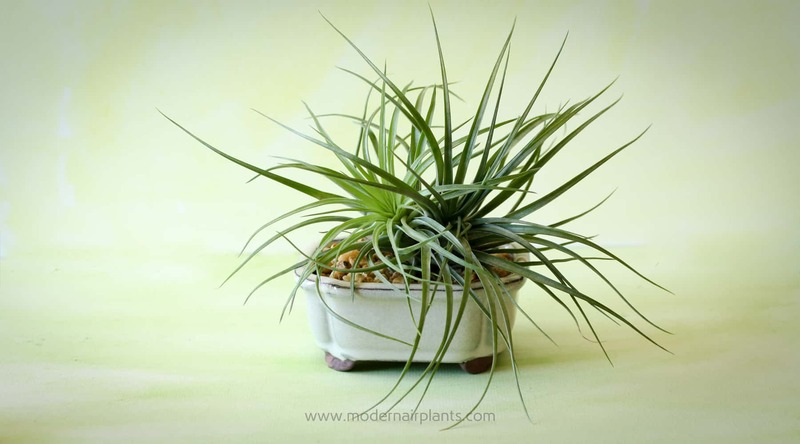 Finding the perfect pot for air plants can be frustrating because there aren’t any pots made with air plants in mind. Most pots are too deep. Some are too shallow. We want a pot after all, not a plate. 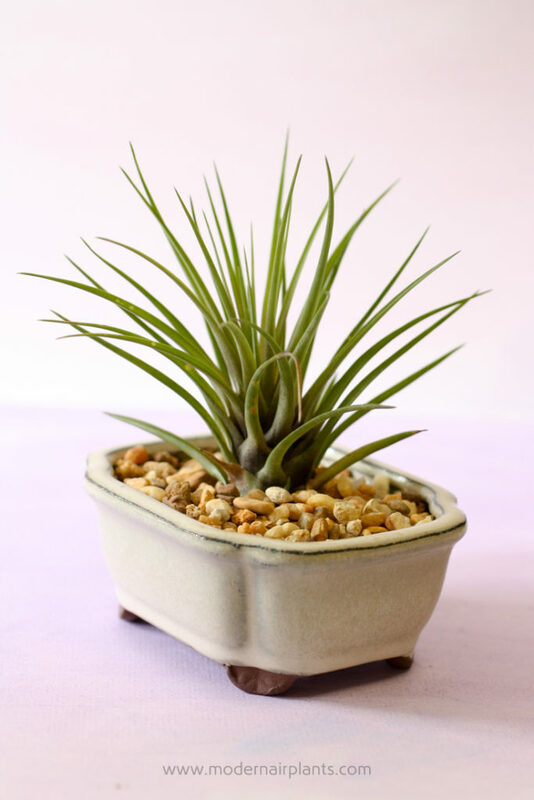 With its delicate leaves and round base this tillandsia fuchsii looks right at home atop the gold and tan rocks in this pearlized vanilla bonsai pot. That’s when I discovered Bonsai Jack’s pots. 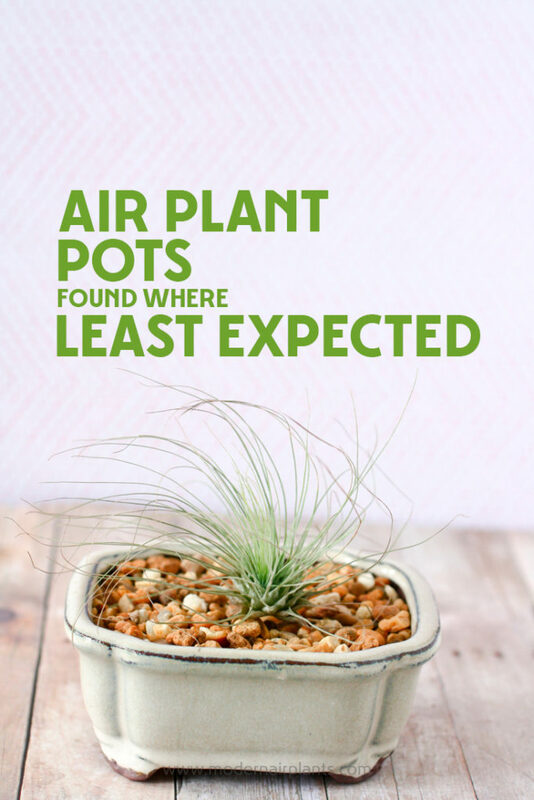 Though made with bonsai in mind, they’re just right for air plants as well. After placing the air plant, in this case a T. tricolor v melanocrater, inside the bonsai pot, simply pour a top dressing around the plant. This stainless steel chopstick is handy for tidying up the display. What’s So Great About These Pots Anyway? These Japapese-style bonsai pots passed 3 design tests: size and color and shape. Bonsai pots are shallow, yet still maintain a distinct pot shape. All of the pots pictured below are 4 inches wide and are less than 1 1/2 inches deep and hold about a of cup of substrate. When looking for a pot, we want a POT! And that means great color. The rich glazes on these pots are truly beautiful-lots of depth. 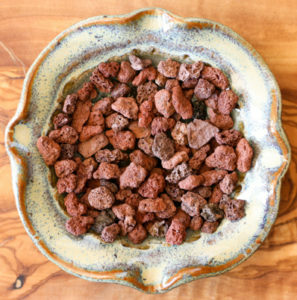 Pictured below are a sampling of the colors that Bonsai Jack offers. These pots come in a variety of pleasing shapes including: oval, rectangular, clipped corners and oval with a lip. The red center of this tillandsia ioantha fuego is complimented by red lava rock and an oval dark amber fire 4 inch bonsai pot. 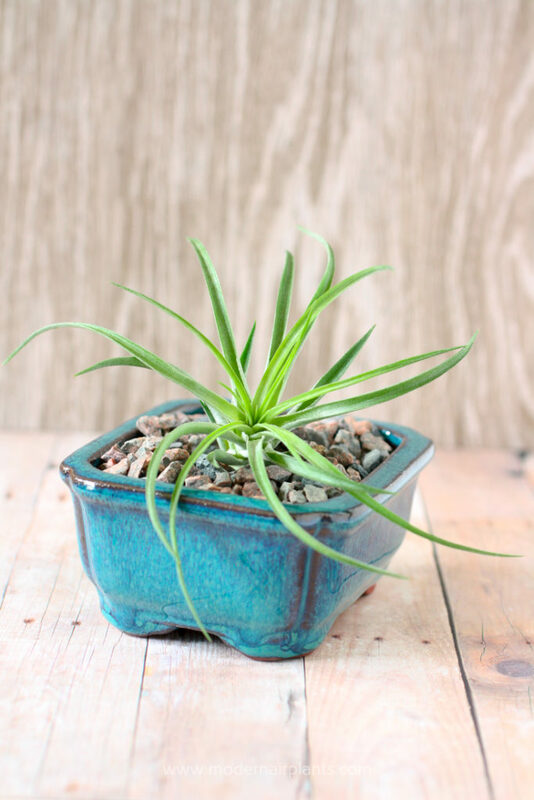 The bright green leaves of this Tillandsia brachycaulos are enhanced by the deep blue of the pot and the reds and blues of the crushed granite substrate. She’s Medusae and proud of it! 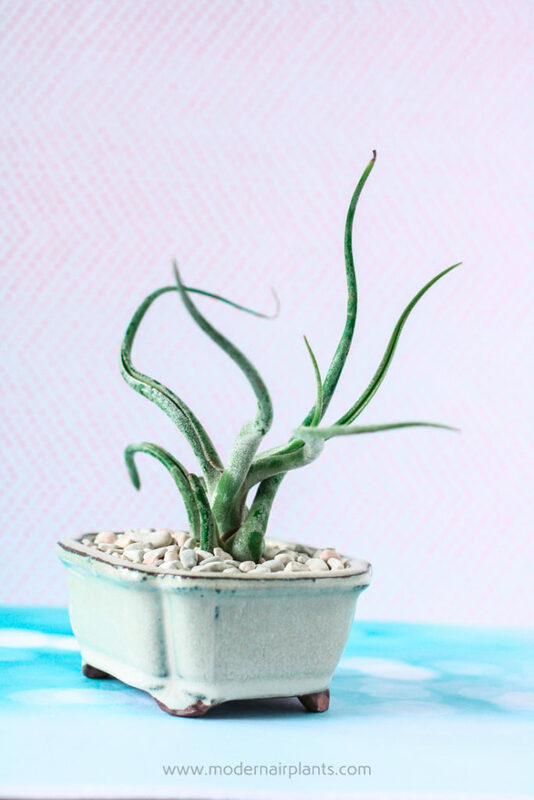 This caput-medusae stands tall in this pearlized vanilla bonsai pot finished with light pastel pebbles. Top dressings serves both practical and decorative purposes. 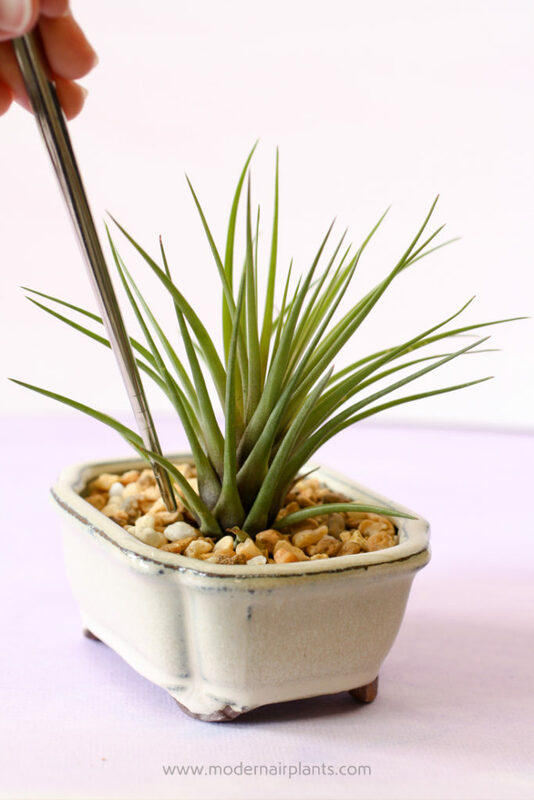 First, it adds stability to the plant so that it can be positioned without the aid of roots. 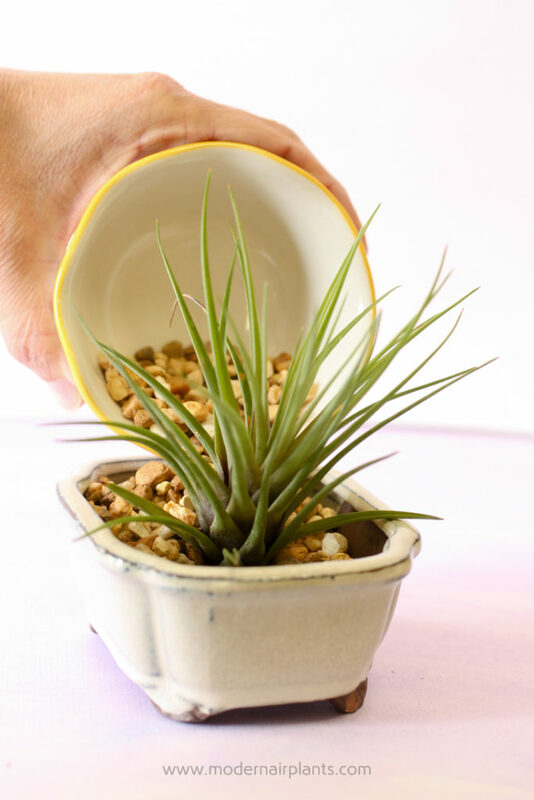 Second, the top dressing gives the air plant display a polished finish, complimenting both the plant and the pot. An assortment of top-dressings are available from Bonsai Jack. 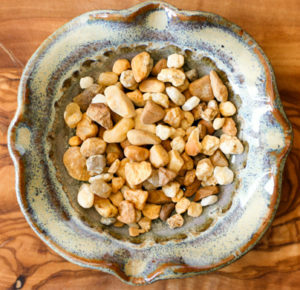 My favorites include: light pastel pebbles, gold and tan pebbles, crushed granite, monto clay, red and black lava rock. These top dressings are clean and natural. No dyes or harmful chemicals are used to enhance the color of the dressings. 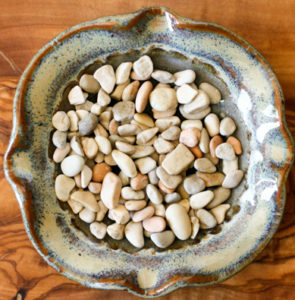 The light pastel pebbles give a hint of color and a lot of class. The gold and tan pebbles are my favorite. 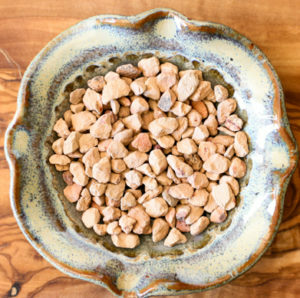 Monto Clay is perfect for that desert landscape. Indigo blues and rusty reds make this crushed granite substrate a stunning color choice. 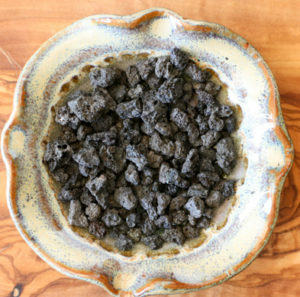 Definitely go with this naturally black lava rock than the paint-stained substrates that are commonly available. 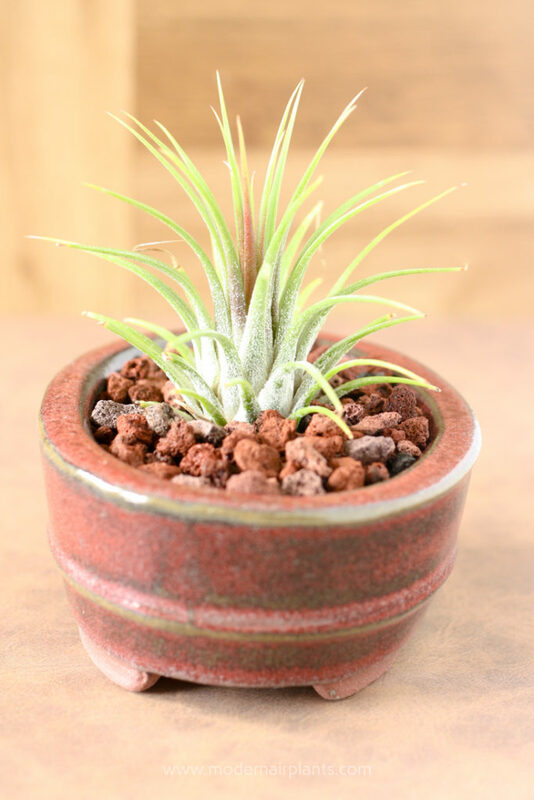 The maroon color of the lava rock looks nice against an air plant’s green leaves. Choose your air plant, your pot and your top dressing and you’ve got it- a beautiful air plant display in the perfect pot!